Stitched Together: Knitting & Crochet Blog Week 2011 - Day Four: Where are they now? 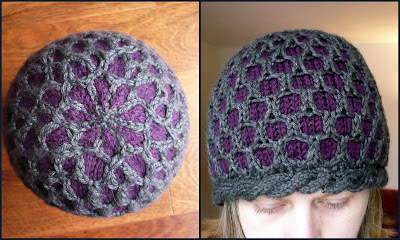 Knitting & Crochet Blog Week 2011 - Day Four: Where are they now? When I saw this topic I knew exactly what I had to write about. I give quite a lot of my knits away as gifts and two of the my most grateful recipients are my friends Martin and Rachael. These two people are a big part of the reason why my life is as good as it is. They are supportive and helpful without being patronising or smothering. They are fantastic and loyal friends. They also like wool (especially Martin who adores it!). Martin and Rachael have a dog called Charlie (who also likes wool and tries to steal it off me when I visit) who needs lots of walking. Several hours a day are spent in the great outdoors, come rain or shine, frost or baking sun. They also like camping and hill walking. In order to contribute towards protecting them in colder times I have knit them both hats, in fact I think Martin now has 2! However, for the purposes of this blog, I am only going to share with you these two specific hats - you'll understand why in a few moments. 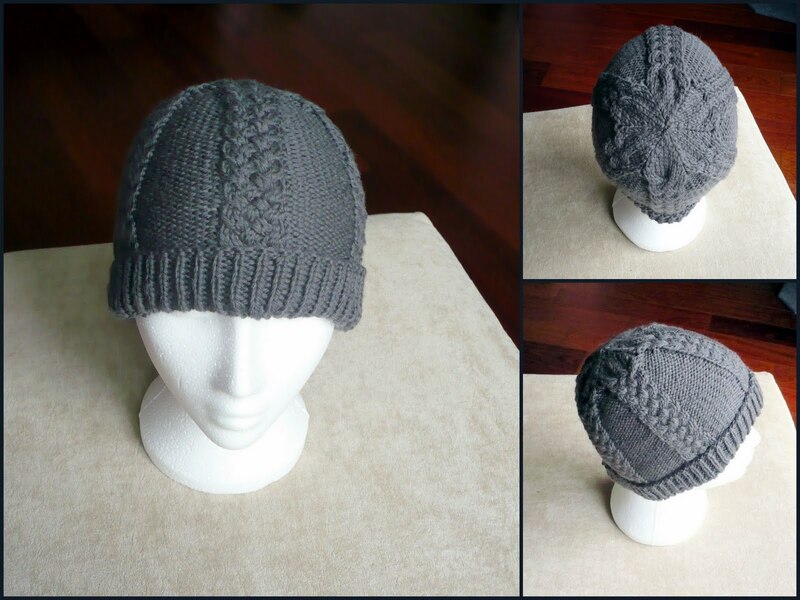 This hat was designed especially for Martin, and is available as the Knotted Cap pattern, either from here, or from direct from Ravelry here. I blogged about this gift here. The hat for Rachael, was a test knit I did back in January 2010 and is the Little Windows Hat by Kristle Chester, which I blogged about here. Whilst I was knitting it, Rachael saw the hat and really wanted it, which meant one less present to worry about in December 2010! I think she forgot about it until she opened her present this Christmas. 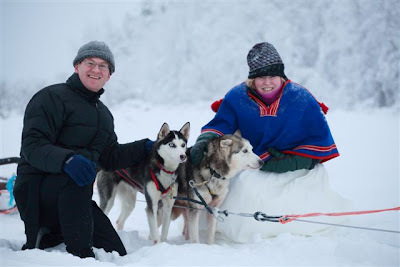 When I started planning presents for these two dear friends I thought these hats would keep them warm while walking their hound, little did I realise where they would end up - they only went to the Arctic Circle, didn't they!!! Martin and Rachael got married this January in Finland, in an igloo in the middle of a frozen lake. Did I mention they like the outdoors? To my delight they took their new hats with them. Admittedly they weren't quite enough on their own, but layered up with a fleece hat underneath, apparently they were toasty warm. Here they are posing with the dog team that took them off after the ceremony - do you see Rachael's dress? I helped her pick it, even if you can't see it very well against the snow, and under the extra layers of warmth. Helping Rach pick her dress and seeing the photos of her and Martin, in my hats, really made me feel like I was part of the wedding, even though I couldn't be there in person. Here are the hats, being worn later, on the sled safari they experienced. They also had a day of adventures on a skidoo. It looked, and sounded like an amazing experience for them both and what an incredible way to get married. They even got to see the Northern Lights! When Martin and Rachael got back from their wedding/honeymoon I was so touched to see the photos with my hats in them. Martin said that I ought to advertise my hats as "Arctic Tested". I'm not sure if I can quite make that claim, but I can certainly say my knits have really travelled! If you want to check out all the other blog posts with this topic, you can click here. The Google Search shows links to all the posts with today's tag. I can't believe how many great new blogs I am finding during this week.